Today is the 26th World AIDS Day. This morning I participated in a WAD ride sponsored by Positive Pedalers, an international cycling club that focuses on erasing stigma of HIV/AIDS by being a positive presence in that community (and to those outside that community). 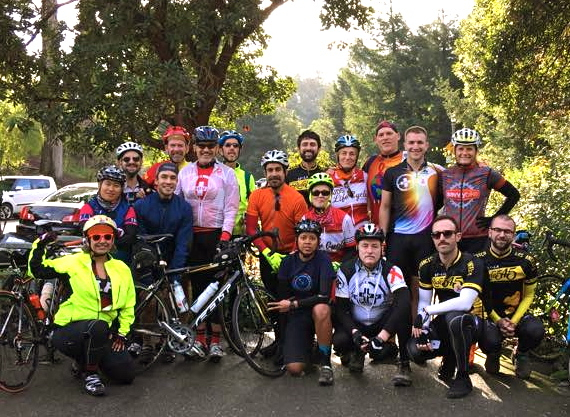 The ride was followed by a ceremony at the National AIDS Memorial Grove in Golden Gate Park. I was a young adult in the 1980s. I worked in theatre during these years, a community especially hard hit in the early years of HIV and AIDS. I distinctly remember my first friend who shared his positive HIV/AIDS status with me. His name was Wayne, he bore a striking resemblance to David Bowie, and I had a terrible crush on him. I haven’t thought about Wayne in many years. As I feared, a quick google search yields no results. Wayne and I worked together on a children’s theatre tour in the Washington, DC metro area. For 10 months, the two of us, along with three other actors, toured schools 5 days a week. We travelled together, performing at two schools each day, in a van packed tightly with costumes, sets, and sound equipment. The five of us became very close. One day, sitting in a Burger King on lunch break, Wayne told us he had tested positive. I remember thinking it was a death sentence. I cried openly. So did everyone else. I held him close. I wondered, since we weren’t very educated about transmission in those early days, if I could contract HIV because I had shared sodas and cigarettes with him. But mostly, I was devastated. I mourned, because he was symptomatic and I knew he would die. Over the years, I’ve had countless friends and colleagues who were HIV positive. I’ve known countless others who have died of AIDS. It’s been a part of my entire adult life. More than a decade later, in 1998, I moved to the San Francisco area. Wanting to find a volunteer opportunity, I registered to participate in the California AIDS Ride, a 7-day, 600-mile bicycle ride that raised funds and awareness for the San Francisco AIDS Foundation. When I registered, I did so because I wanted to improve my health and I wanted to feel a part of my community. But, like many participants, as I trained and then completed the ride, it became more about HIV/AIDS than about me and my goals. And what I learned through that experience was that there were many folks who lived with HIV and AIDS and also rode their bicycles in that event. AIDS was no longer a death sentence. There’s a prevailing feeling, especially among our youth, that AIDS is not dangerous. It won’t kill you. It’s a thing of the past. There are drugs to treat it. And that’s the demographic that’s seeing an increased diagnosis of HIV and AIDS. So, today, I ask you to think about AIDS. Remember that we’re still fighting this disease. And, if you have the opportunity to influence a young person about the risks and prevention, please don’t hesitate to take action.